Telecommunications operator, Etisalat Nigeria has received the prestigious International Organization for Standardization (ISO)14001:2004 Environmental Management System (EMS) certification, reports ITRealms. The certification, ITRealms gathered heralds Etisalat as the first telecommunication company in Nigeria to successfully implement the ISO 14001:2004 standard. Also, the certification, ITRealms reports, was awarded to Etisalat Nigeria by Bureau Veritas, a global leader in testing, inspection and certification, is conferred on organisations that establish and run an environmental management system of the highest standards. Confirming this, the Managing Director, Bureau Veritas Nigeria, Mr. Sebastiano Fruciano, while presenting the certificate to the Chief Executive Officer, Etisalat Nigeria, Mr. Matthew Willsher, in Lagos, commended the telco for surpassing the set standards for the industry. “We wish to congratulate Etisalat Nigeria on achieving this great feat. We commend you for establishing and operating one of the best environmental management systems in the country, at least the best among telecommunications operators,” Fruciano said. “The successful incorporation of ISO 14001: 2004 EMS into our business operations is a confirmation of our continuous commitment to excellence and regulatory compliance. This international certification has again affirmed the leadership role we play in the industry. We strive to be the best in everything we do, from product innovation to service delivery and compliance with all relevant regulations and we will continue on this path,” he said. Head, Environmental Compliance and Public Relations, Oluseyi Osunsedo, said Etisalat as a socially responsible organisation takes compliance, stakeholder interest and best practice very seriously. “We have voluntarily set the highest standards of performance for ourselves and our business partners to ensure sustainability is interwoven into business decisions. The result of this is that every aspect of our operations does not only comply with our internal operational policies, but all operations meet and where possible, exceed the local regulatory requirements as well as conform to international best practice,” she said. Osunsedo further said that, indeed Etisalat is the first operator in Nigeria and possibly in Africa to get certified to the ISO standard for environmental management. “This goes to show that Etisalat is doing many things right particularly in terms of proactive management of environmental concerns. The recent ISO certification is an independent validation that we are operating our business in such a way that prevents negative impacts on our operational environment,” she said. 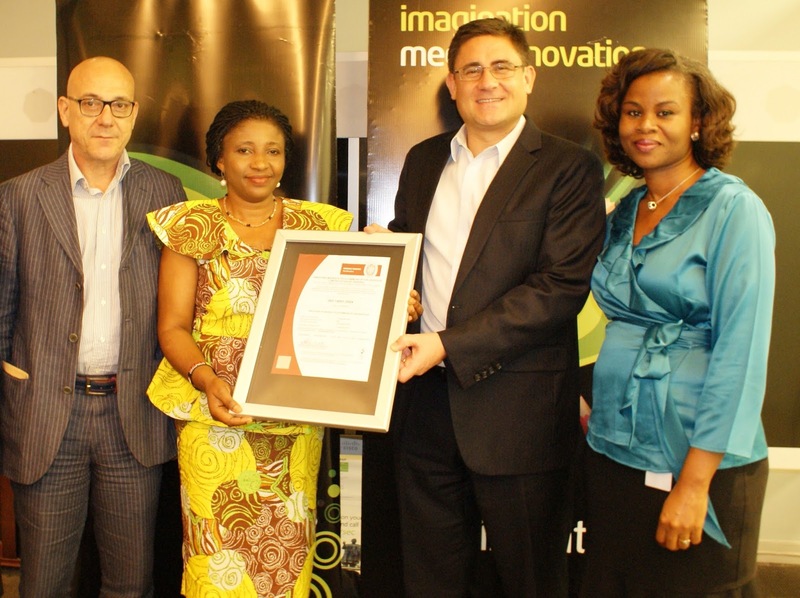 Pix: L-R: Managing Director, Sebastiano Fruciano; System Certification Manager, Adenike Akinbote, both of Bureau Veritas Nigeria presenting the ISO 14001:2004 EMS Certificate to the Chief Executive Officer, Etisalat Nigeria, Matthew Willsher in company of Head, Environmental Compliance and Public Relations, Etisalat Nigeria, Oluseyi Osunsedo.